Transformers are devices that are used to change the voltage of an AC current. 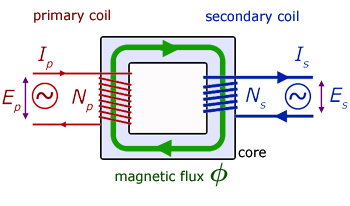 If we connected an iron core to a battery, we would turn it into a magnet with a constant magnetic field but if an AC current is flowing through the primary coil, a changing magnetic field will be induced in the iron core. This changing magnetic field is similar to moving a magnet near a coil: it will induce an AC current in the secondary coil. It is a method of transferring energy and energy is conserved. This means that the electrical energy in the first coil must be equal to the electrical energy in the second coil; and the power in the first coil must be equal to the power in the second coil. To conserve energy and power, which is energy per second, if the voltage in the second coil decreases, its current must increase. Transformers are used in the National Grid to step up the voltage from the power station and transmit energy at a high voltage, low current to reduce loss in the wires heating up and to step down the voltage to make it safe for use in the home.